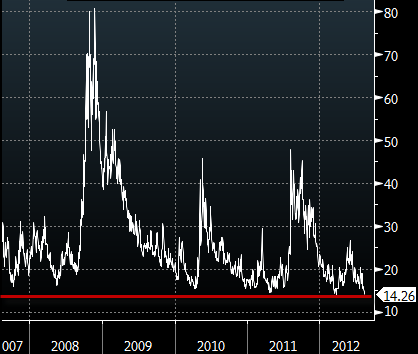 The VIX index hit a multi-year low today (it went below 14.1 this morning). With interest rates at historical lows, investors are shorting options to become long "theta". Option decay seems to be the only way to generate income. The bet is that no major fiscal decisions will be made in the US until after the elections, the Fed will announce QE3 soon, the next set of corporate earnings is not out for a while, and Draghi has Europe under control. All the macro risks have been resolved for now and we should not expect more near-term volatility.